No ADHD drug is perfect. They all have their problems. But as far as ADHD medications go, I believe that Vyvanse is the best ADHD medication for adults. Millions of people with ADHD most likely agree with me on this one, too. 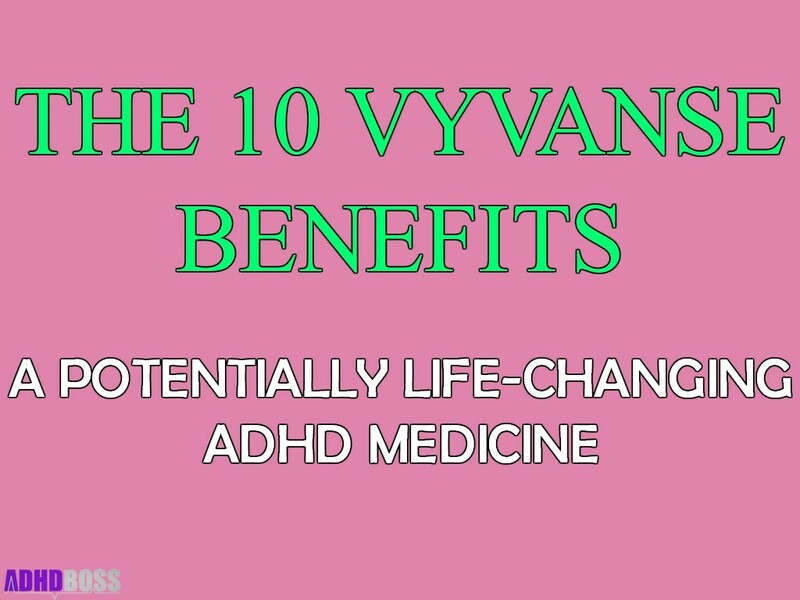 So, just keep reading to discover the 10 Vyvanse benefits that just might change your life! Vyvanse is a smooth, long-lasting ADHD medication that makes you feel sharp, smart, and alert all day long. When you take Vyvanse, you’ll most likely feel like you’re in a “flow state”. This is an awesome feeling, because it can sometimes be extremely difficult for people with ADHD to enter a flow state otherwise. Taking Vyvanse is a lot like forcing your ADHD brain to buckle down, and focus on whatever task you need to take care of. When you’re on Vyvanse, you’ll either LOVE talking with other people, or you won’t want to be bothered at all. Your sociability will probably depend on how much work you have to take care of during the day. Either way, you’ll definitely be in the zone for whatever you have to take care of. Vyvanse should cover most of your bases when it comes to temporarily eliminating ADHD symptoms. Before taking Vyvanse, you might feel a little bit lethargic, unmotivated, or sleepy. After taking Vyvanse, you’ll most likely feel optimistic, motivated, and prepared to tackle whatever challenges you have to face. When I used Vyvanse for one full year, I was so engulfed in my school work and business growth, that I barely had time to even think about procrastinating or avoiding important tasks. So, once you take Vyvanse, you’ll feel focused and on top of your ADHD symptoms. ADHD has been linked to a lack of dopamine production in the brain. They still use imaging specifically to monitor different markers of the dopamine system in the brain of individuals with ADHD. We studied 55 of those individuals and 43 healthy controls and then compare the brain of these two groups of subjects. And found that indeed as what have been suggested by clinical stories. There was a significant deficit in the function of the dopamine reward pathways in individuals that have ADHD. So, when you have ADHD, there’s a good chance that your brain doesn’t produce enough dopamine. This is a major problem, because dopamine production helps you stay motivated, seek rewards, and live a high-quality, purposeful life. Luckily, taking an ADHD medication like Vyvanse can usually solve most of these problems for you. Vyvanse is lisdexamfetamine, which is a prodrug of the central nervous system (CNS) stimulant dextroamphetamine. The dextroamphetamine found in Vyvanse is also paired with L-lysine, which is an essential amino acid. And, taking Vyvanse (lisdexamfetamine) essentially provides your ADHD brain with the dopamine production that it desperately needs. Multiple sources on PubMed indicate that pharmaceutical amphetamines appear to promote brain development and nerve growth in people with ADHD. This makes sense, because after you take Vyvanse, you will most likely think, act, and live your life at an “elevated” speed. You’ll finally be in a position to take care of your work on time, enjoy good relationships, and function in society. In other words, Vyvanse can genuinely help you turn your life around, because it’s a medication that shows you what you’re truly capable of accomplishing in life. In a previous article, I wrote about how I stopped taking Vyvanse after one full year of use. I don’t currently take Vyvanse any more. But, the beautiful thing is that I respect what Vyvanse has done for me, and I’m perfectly OK with using Vyvanse once again at some point in the future. As of now, I haven’t felt the need to use Vyvanse again, because I’m a writer, and I don’t work in an overly-demanding role at this point in my life. But, I very well may pick up a prescription for Vyvanse at some point in the future, because I understand just how beneficial Vyvanse can be for mentally-draining activities like accounting, doing taxes, cleaning the whole house, getting organized, etc. To be perfectly honest, there are still times when I crave Vyvanse, and know that I would benefit greatly by using it. So, the point is that Vyvanse can be a temporary or permanent solution for your ADHD symptoms. It just depends on how you want to use it. The choice is entirely yours. If you aren’t sure what to think about Vyvanse, I recommend talking with your doctor about getting a Vyvanse prescription, and seeing if you can try it out for a little while. If you like Vyvanse, then you’ll most likely want to stay on the medication for a while. If you don’t like it, then no one is going to force you to take it. It’s your life. So play by your own rules! I experienced some weight loss from Vyvanse, which honestly wasn’t a terrible side effect given my personal situation (your results may differ). But more importantly, when I used Vyvanse, I was able to find the time to exercise more often, and eat healthy foods. I was probably in the best physical shape of my life while taking Vyvanse, because I was eating extremely healthy foods, and I was exercising five or six days per week. So, if you decide to use Vyvanse (under the supervision of a doctor), and you follow the general philosophy laid out for you on ADHD Boss (exercise, eat healthy brain foods, have fun) – then you will almost certainly experience similar, awesome results for yourself. Vyvanse was the tool that helped realize what I was actually capable of accomplishing for the first time in my life. Using Vyvanse enabled me to grow a website, take on multiple clients for my freelance writing business, get in excellent shape, and generally just make the most of my life. So, I’m willing to bet that Vyvanse will do something similar for you too. There are many positive Vyvanse reviews and success stories out there. Of course, Vyvanse isn’t a perfect medication by any means. I’m not trying to make Vyvanse out to be the perfect “wonder drug”, because it has some obvious flaws as well. But, Vyvanse will help you become more efficient in your everyday life. When you take Vyvanse, you’ll probably feel like you need to be productive. This sudden urge to be productive just might motivate you to do a better job at work, start a small business of your own, find an entirely new career path, or unlock a number of other possibilities. Like I mentioned before in this article, I only had to take Vyvanse for one year to pick up positive habits (like working hard, organizing my house, and eliminating time-wasting activities). Today, I continue to utilize those same positive habits which have made me a more efficient person. If you have ADHD, then you’ve probably felt like you’ve been at a disadvantage for most of your life. You’ve probably found school, work, relationships, and life in general to be a constant battle. But, if you decide to try an ADHD medication like Vyvanse, there’s a good chance that you’ll discover what it feels like to have an “upper hand” in life for the very first time. Taking Vyvanse almost feels like you’re cheating at the game of life. But in all honesty, you’re just using a world-class pharmaceutical product to “compensate” for some of your brain differences. This is fair game. In other words, you have absolutely nothing to feel guilty about if you decide to use Vyvanse to improve your ADHD symptoms. You’ll finally be able to lessen the mental strain that you’ve most likely dealt with for most of your life. People who take ADHD medication generally get good results. This has been ignored for far too long. I’ve never heard of anyone with ADHD who took Vyvanse, and then saw a decrease in performance in their career or business. Instead, most people claim to experience a newfound enthusiasm for their work after starting a Vyvanse prescription. I used Vyvanse to launch the ADHD Boss website. I worked on ADHD Boss for one full year while I took Vyvanse every morning. And honestly, I don’t know if this website would exist today if I hadn’t taken Vyvanse during that period of time. I had actually abandoned this website for quite a while before I tried ADHD medication. And, I only returned to working on ADHD Boss because of the initial dopamine rush that I received from Vyvanse. So, when people ask me why I appreciate Vyvanse, I have to admit that I’m a little biased in favor of the medication, because this website literally wouldn’t exist without it. Best of all, you can apply my personal experience to your current situation. If you’re going through a difficult time with your career or business, then you might use Vyvanse to power through the challenging times ahead. If you decide to use Vyvanse, I can almost guarantee that you’ll experience more noticeable progress in your career or business than you’ve ever had before. And remember that you don’t have to use Vyvanse forever, if you don’t want to. I appreciate that Vyvanse played an extremely important role in my schoolwork, business, and career for just one year of my life. See if you can achieve great results for your life with ADHD medication, and be open to the possibilities that come from it. Before you read any further, please keep in mind that I can only speak about my own personal experience in regards to using Vyvanse. You’ll have to chat with a good physician who’s familiar with ADHD medication if you want to understand all of the risks of taking Vyvanse (including the Vyvanse side effects that you can potentially experience). But in my case, I enjoyed taking a 20mg dose of Vyvanse on most days, because I experienced the biggest Vyvanse benefits from just a relatively tiny dose. I used Vyvanse titration (also called the “Vyvanse dosage hack”) to take minimal amounts of Vyvanse at a time. I found that taking relatively small amounts of Vyvanse provided me with the best results, and the least amount of side effects. So yes, I literally took a chid’s dose of Vyvanse 90% of the time. But, if you’re willing to learn from my experience, then you just might find that a small amount of Vyvanse gives you the best results, too. This is also referred to as finding your “minimum effective dose” (MED). You should find your MED for Vyvanse, and stick with it. You’ll be much happier over the long-term. I don’t think that anyone should value their self-worth based on an ADHD medication like Vyvanse. You should obviously try your best to be a confident person regardless of the medications that you take. But, I’m not going to lie, either. The truth is that taking Vyvanse will make you feel incredibly more confident in your skills and abilities. Almost like Bradley Cooper in the movie Limitless! Vyvanse fuels your ADHD brain, and gives you the confidence that you need to live your life at a high level. You might as well enjoy the Vyvanse-induced confidence boost, and make the most of it. Overall, I give Vyvanse a rating of 8.5 out of 10. I rate Vyvanse as the best ADHD medication, because there’s nothing that even comes close to Vyvanse in terms of smoothness, potency, and ADHD symptom relief. Vyvanse is not a perfect ADHD medication by any means. It definitely has its flaws (which I’ve addressed in other articles on ADHD Boss). But, Vyvanse still beats all other ADHD medications in just about every possible way. Please remember to use Vyvanse responsibly – under the supervision of a doctor. And, make sure to treat your ADHD medication with respect. Vyvanse is an extremely powerful ADHD medication. But, if you use Vyvanse wisely, then it will take great care of you and your ADHD in return. I’m in my 30s. I have 2 children and a wife. A 3rd child is on the way. I struggled so badly in grade school that I barely made it out of high school. I was held back twice and my love of computers was the only thing that proved to the teachers around me that I could actually be motivated enough get through the process. I’ve been beaten down most of my life and called different, not normal. It’s plainly obvious to most from the time they see my hyperactive communication skills and my inability to slow down and engage on a “normal” adult level of conversation that I’m generally not quit like everyone else in the room. It’s taken years to figure out why this is the case. Years of me asking why it is that I’m so different and trying so hard asking what it is that I need to change about myself in order to be like everyone else around me. In my teen years, I darn near failed out of high school because I would hyper focus on things that other students just wouldn’t be interested in. I learned to program when I was about 11 years old by decompiling old programs and learning how control structures worked. That means I was reading programs in hexadecimal. By 16 I was writing music and learning how sound worked, teaching myself digital signal processing and music theory. At 19 I paid for my first car writing websites for companies and at 22 I had a business writing music for films. The highlight of my high school years was winning the school science fair, and yet I was asked to leave by a guidance counselor because my grades were so bad they were making the school look bad. Needless to say I did graduate. I went to community college. I went on to get my bachelors in computer science and worked in the field simultaneously. Then I went on to get a masters. It’s been a huge struggle for me. Hyperfocus is a blessing and a gift, especially with children. I love my children so much but my brain forces me to want to solve bigger and bigger problems and unfortunately my children just want a father that does simple things with them, of which I often find it hard to do. I’m presently attempting the PhD program and just started on vyvanse. I’m finding so far that it was been life changing. I never realized how much constant noise there was in my head until I had a filter like Vyvanse to crank it down. I’m finding it a lot easier to work in my office and have my kids disrupt me and be able to take time for little moments with them without having to shoo them away because I’m worried I’ll lose what was in my head. I’m also finding I’m able to listen to people effectively and communicate better without the extra anxiety of worrying about how to respond when I miss key points they said because my ADHD got in the way. I’m looking forward to this newfound superpower and I was excited to see that your article confirmed for me some suspicions that I had already been thinking about this medication! Corey your background is incredibly similar to mine and many other people with ADHD. It’s a very common “theme” that happens to many of us in grade school. That’s incredible to hear how well Vyvanse is working for you, too. Thanks so much for sharing your interesting perspective! Thank you for sharing your personal experience. You will help others. So you are for sure ADHD? I know this article is over a year old, but I’m hoping you still read comments. What do you think of taking Vyvanse every other day or 3 days on/3 days off to avoid tolerance? I finally was prescribed Vyvanse after 40 years with very bad ADD, and I absolutely love it. This is the first time in my life I feel like a regular human being, able to start a task, work on it, finish it, and move on. It’s amazing. Life changing. But I am afraid after reading all these stories of people who it worked great for and then they built tolerance, and now no matter how much they take, it doesn’t help. I read your MED article, so I may try that. But what is your opinion on skipping days? Hi Stacie. Every other day or 3 days on & days off is great. I think you should do whatever suits your lifestyle (under a doctor’s supervision of course). Really happy to hear Vyvanse is working so well for you. After nearly 2 years working with a psychiatrist who clearly had no idea how to treat ADHD I’ve found someone who does. He’s just started me on Vyvanse which I’ll be able to get next week. If it’s able to do half of what it did for you I’ll be forever grateful. I’ve been trying with spirts of success to start my own business. It’s really frustrating when you hit mental roadblocks and procrastinate on arguably simple stuff yet let yourself run down many rabbit holes, not getting the things done that will in end generate income. Then get overwhelmed to the point you’re almost doing nothing. So yeah, fingers and toes are crossed that Vyvanse helps get me moving in right direction and implementing becomes easier. Awesome Simon. How is it working for you? I have ADD with an anxiety disorder. Will this medicine exacerbate my anxiety? It totally depends on your individual reaction to the medication Sandra. Everyone is different! Vyvanse is the only medication that’s ever helped me since I was a child. I can focus, work, get more things done, think clearly and stay creative…all at the same time. Awesome to hear Rosie. It worked extremely well for me too while I used it. I just started taking vyvance today, I don’t like the jittery feeling. Will this jittery feeling go away in time??? In my experience, the jittery feeling actually *does* go away after 1-2 weeks. Your body needs time to adapt. That said, please talk to your doctor if you keep feeling jittery! I’ve been on Concerta then biphentin both worked quite well except for not being able to urinate properly and some constipation issues but the biggest problem was my voice change . I sing rock/metal and I had read that these medications can raise your vocal octave a bit so I thought bonus ! Wrong ! Lost my main mid range had serious lump in throat feeling and ive not been able to sing for last 3 months so I quit cold turkey to see if my voice would return no luck yet 🙁 . I was told this is a very rare sise effect by my Dr and a Physiologist have you ever encountered this before . My Dr says I really should try my prescription of vyvanse but Im even more depressed about my voice loss. And yes got checked by an ENT and no acid reflux disorder causing it, no nodes looks all clear. It feels like it over tight like ive been singing for hours yet ive not hardly said a word often feels like its coated or something it just feels different but what comes out now sounds like im going through puberty again at 47 !? Wow I haven’t heard of that side effect before Adrian. That sounds pretty serious. I hope you find a way to continue singing without any issues (whether you decide to continue medication or not). Finding your website has been the greatest thing to happen to me after finding out I have ADD! Thank you. I took vyvance 20 mg for a total of 5 days. First day was amazing. Finally felt normal. Second day, ok then pretty bad stomach ache. Spent the last 3 days in bed because of debilitating migraines. I kept reading headaches are a common thing that goes away. Did you experience or have heard of anyone starting off like this? So awesome to hear from you Sharon I really appreciate your kind words. Headaches are normally associated with dehydration from what I understand. But to be safe, this is definitely something I would definitely recommend chatting with your doctor about!